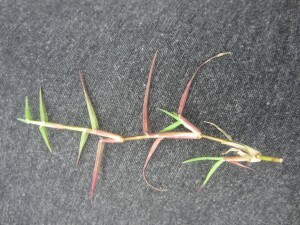 Goosegrass (Eleusine indica) is a summer annual weed that typically germinates after crabgrass in the spring. 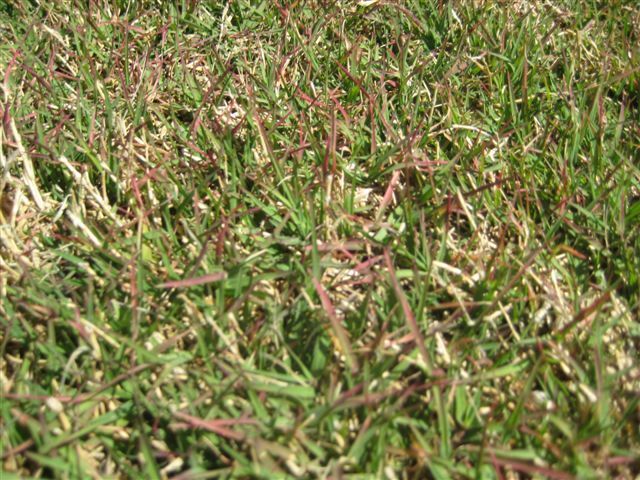 That is about when the soil temperatures consistently reach approximately 60° F. Like crabgrass, goosegrass is best controlled with a preemergence herbicide. 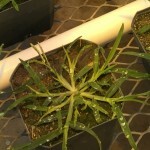 Herbicides that contain the active ingredient oxadiazon work very well. Other preemergence herbicide efficacy can vary. But as it seems like everyone has already put down preemergence herbicide so, you have nothing to worry about. Well what if you didn’t? There are some post application control options. 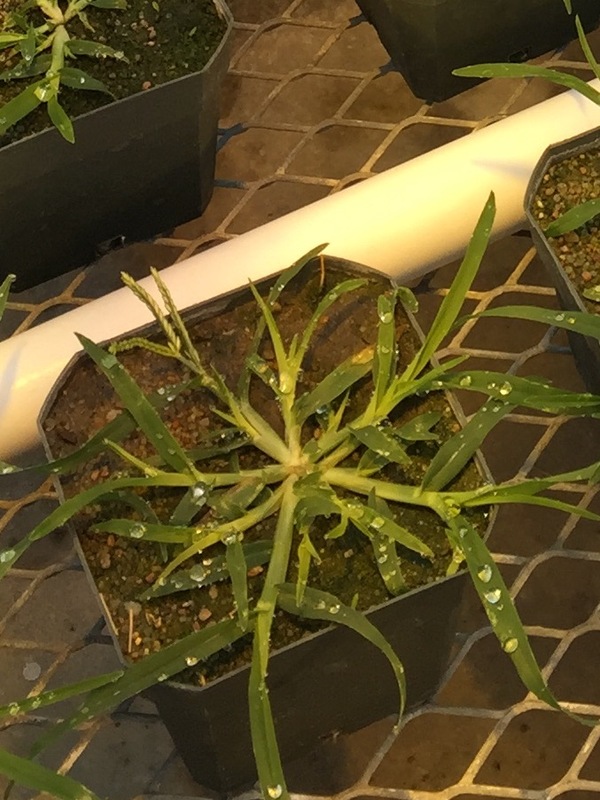 To determine what herbicide you want to use this summer to control goosegrass, that might have escaped your PRE treatment or maybe you have the ‘itch’ to go kill some goosegrass, it all depends on the turfgrass you have. If you have cool-season turfgrass then you can use fenoxaprop (Acclaim Extra), fluazifop (Fusilade II), tropramizone (Pylex), or MSMA (golf courses and sod farms only!). 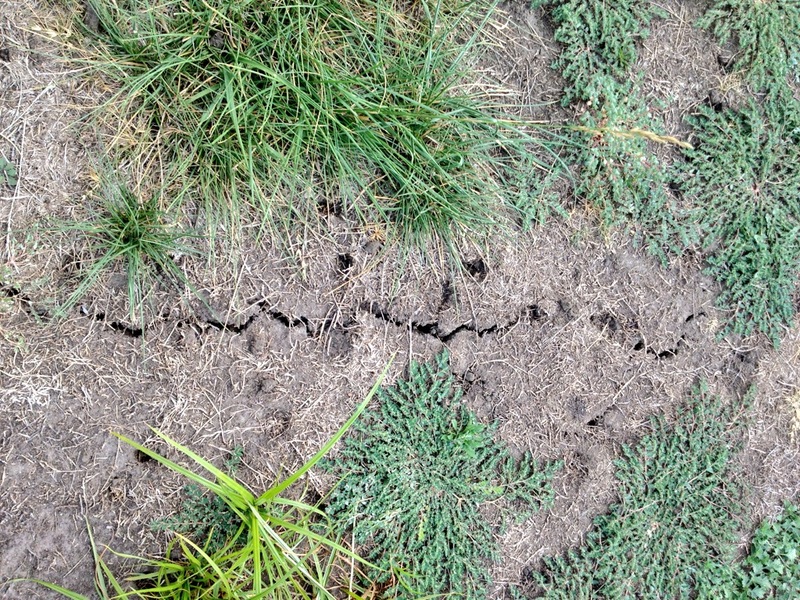 You will probably have to do more than one application if the goosegrass is tillered out. 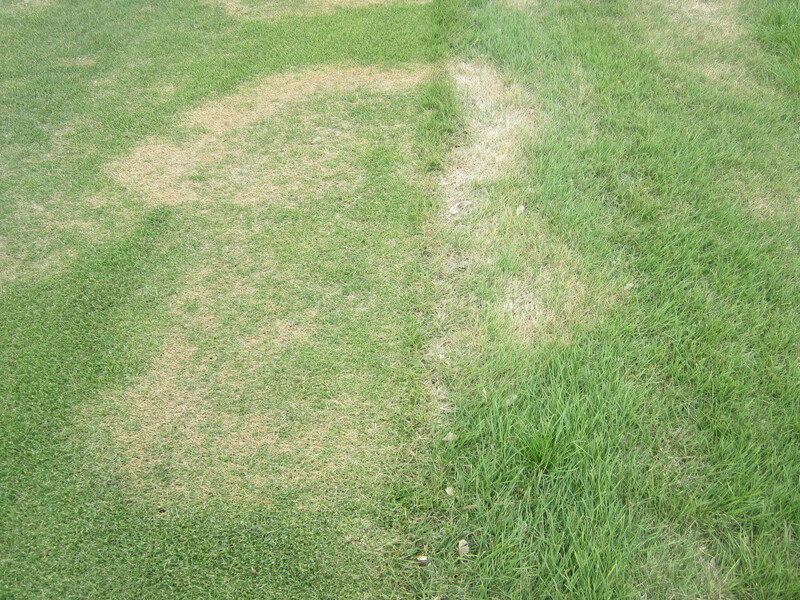 Sulfentrazone (Dismiss) is also effective on goosegrass if it has not tillered out yet. 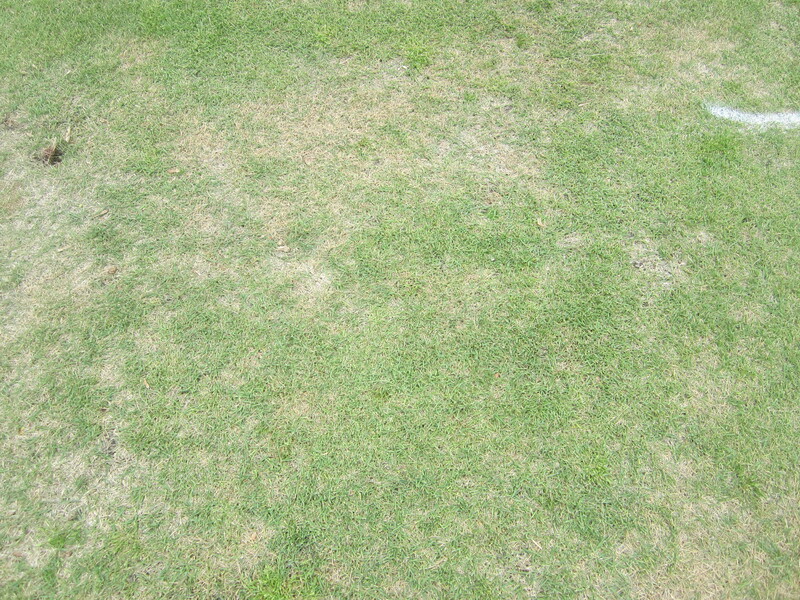 Now if you have bermudagrass or zoysiagrass then you can use Tribute TOTAL (thiencarbazone + foramsulfuron + halosulfuron). 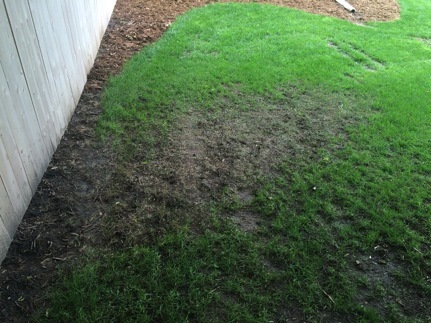 Fusilade II and Acclaim Extra that works in cool-season grass can also be used on zoysiagrass. If you mix these products with triclopyr (Turflon Ester Ultra or Triclopyr 4) then you will get better results. I hope the poem wasn’t boring but added a little fun to this turfgrass weed science blog post. Hope everyone has a great rest of the week and weekend! This was a post from last May on the old blog that I thought I would repost so everyone had the information for this year! 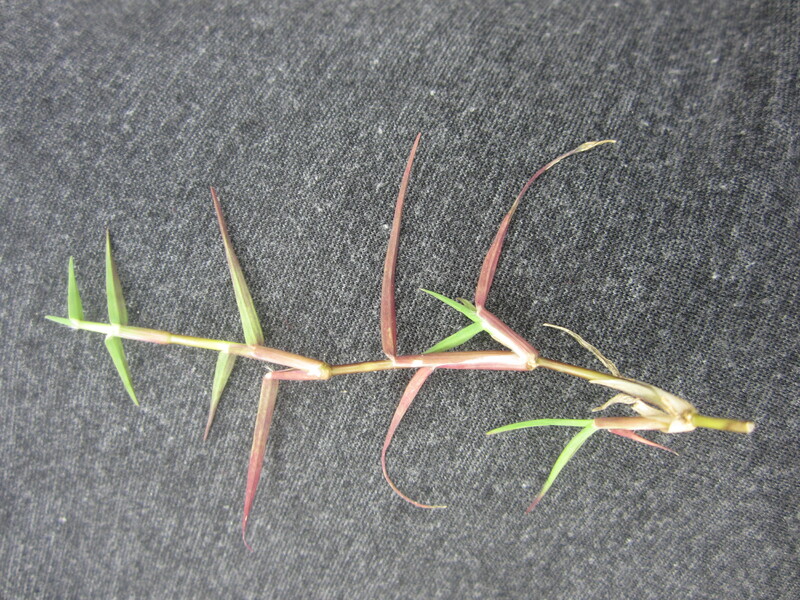 Yellow nutsedge can not only grow in wet soils but also extremely dry soils as well. 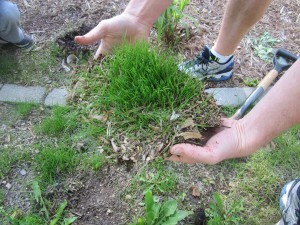 Small packages of Sedge Hammer are available to homeowners. 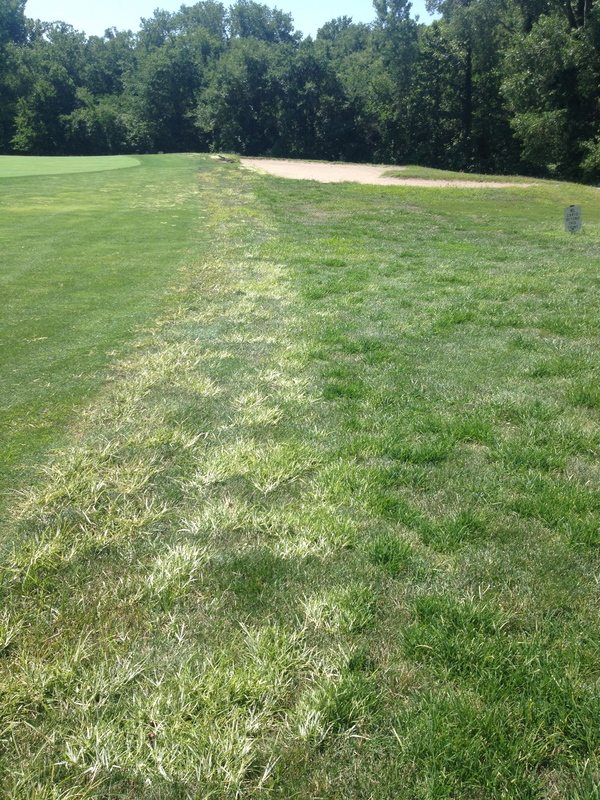 Using a non-ionic surfactant with the Sedge Hammer will give better control. This spring, when the rains began to come, I started to notice a slight discoloration in my front yard next to my fence. The area was very shaded and has always struggled, so I thought nothing of it. However, as the weeks passed, the area became more defined with wilt and it was clearly showing itself as a “man-made” phenomenon. 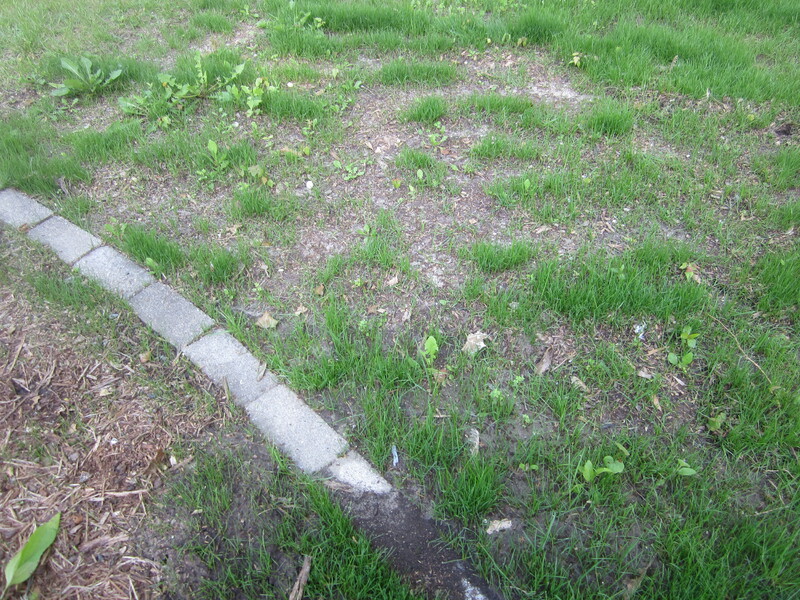 Thinking back through my maintenance, there was only one thing that could have caused that shape and slow death: the herbicide I had sprayed uphill of the site to maintain bare ground weed control in my mulch. 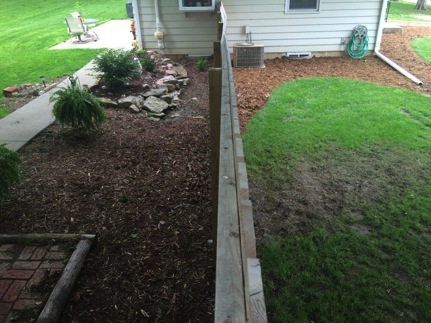 The history… I developed a bad habit of maintaining empty large bed areas with bare ground herbicides when I lived on an extremely flat property at my last house. I hate weeding and the fewer applications I have to go out and make each year, the better. I had used bare ground herbicides frequently at my job to maintain fence lines and other areas to cut down on weed eating due to a limited labor force. Over those few years I had little to no herbicide movement from the sites that I sprayed. That created a false sense of invincibility in my herbicide applications, which is never a good thing. 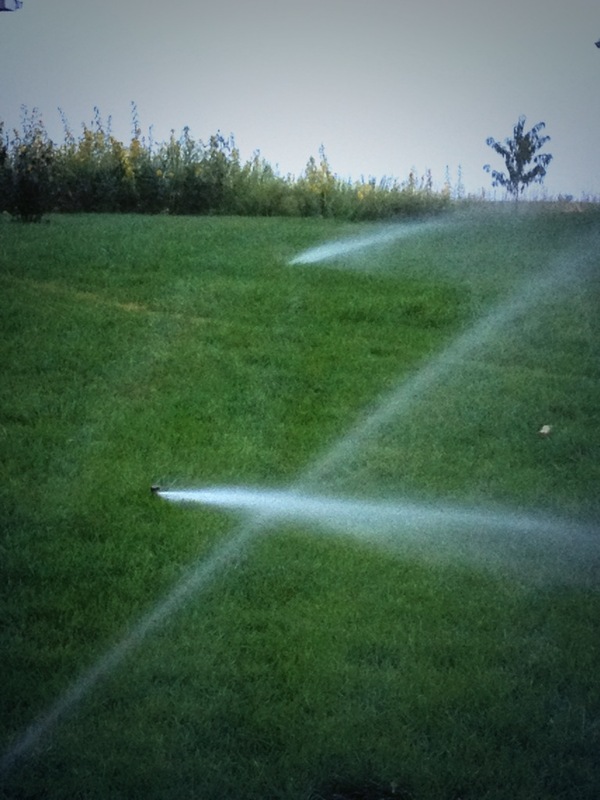 Fast forward to today… Unfortunately for my lawn, my property has a pretty hefty back to front slope and a lot of water moves over it when it rains. 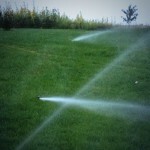 That means that my property is a prime area for herbicide movement and this spring has proved that. So pay attention to your site and THE LABEL! Trying to cut corners will eventually come back to haunt you. Chemical companies put large amounts of money into researching for those labels to give you instructions so you don’t encounter these issues. My lawn and my pride have paid the price for my undeserved hubris. 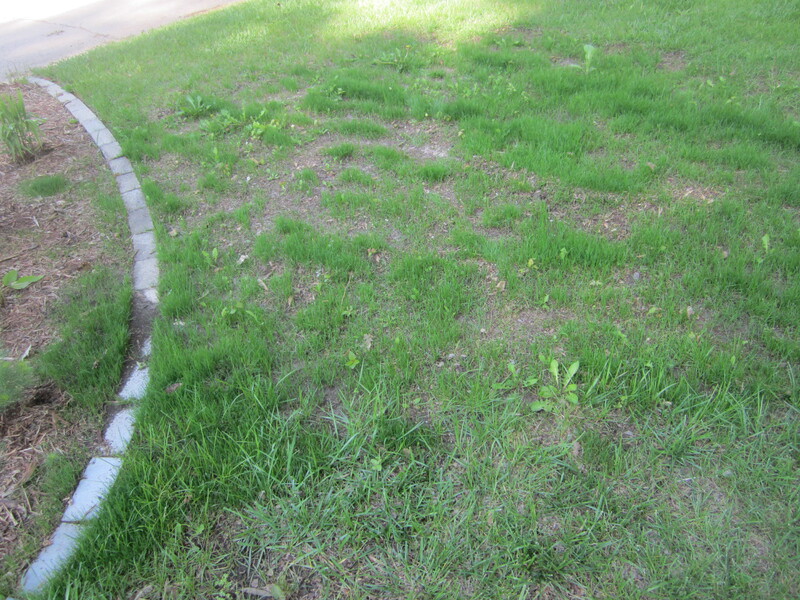 Thankfully, given a little bit of time for the herbicide to break down in the soil and some grass seed later this fall, things should be repaired. 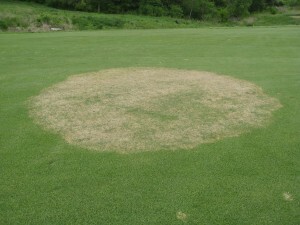 With all the recent rain, large patch in zoysiagrass is definitely active. 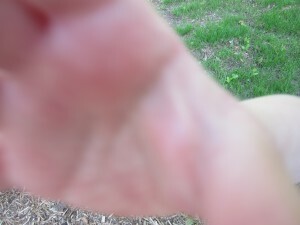 I’ve already posted some info, here are just some more photos to show symptoms at Rocky Ford. 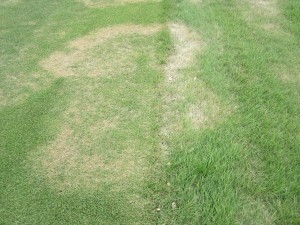 The top two are at fairway height, and the bottom shows the disease at two mowing heights. I have a quick story to share that is kind of funny, and it is disease-related in an indirect way. At my house, we had a Scot’s pine that we figured would eventually get pine wilt. Last year, it got the disease, and like good citizens we took it down and destroyed the wood. (That is the disease part of the story). 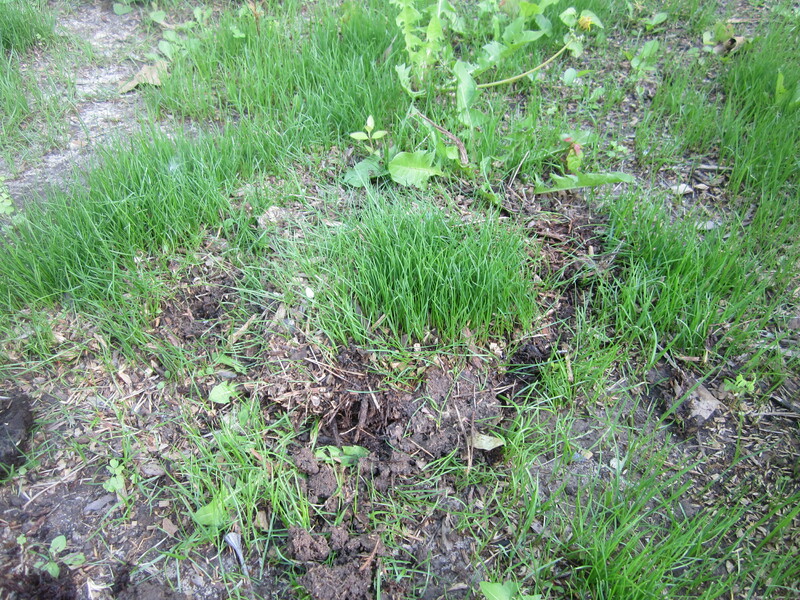 This left a bare spot in the lawn, so we planted some seed. A day or two after that, Manhattan got some drenching rains and flooding. Our seeds (and the soil) moved around in all the water. Some of it moved down the slope all the way into the flower bed. The rest ended up pooled/clumped. If you click on the photos below to zoom you will see it better. It’s a little hard to tell in the photo, but the ground slopes from upper right to lower left. 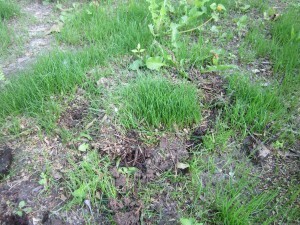 Our grass seeds, and some of the soil itself, got washed down into the flower bed where it is now growing nicely. So, we decided to try an experiment and transplant some of the clumps from the flower bed back up into the bare patches. Iris Leaf Spot is active and has been favored by the cool, wet weather conditions we are currently experiencing across much of Kansas. 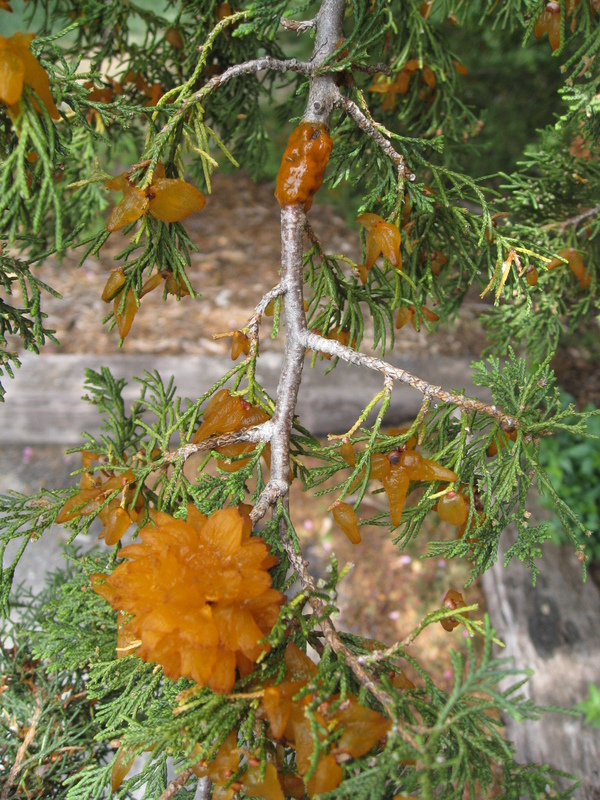 The spots are typically found on the leaves but can occur on the stalk and buds of the developing flower. 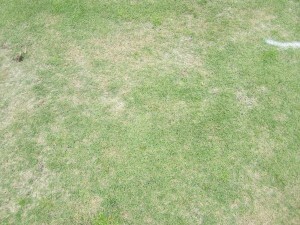 The spots are dark with a reddish border and will appear water soaked followed by yellowing of the surrounding tissue. The edge of the spot has a water-soaked appearance. (Image by Megan Kennelly). Click to zoom. The leaf spots develop a yellow border. Image by Bethany Grabow. Click to zoom. 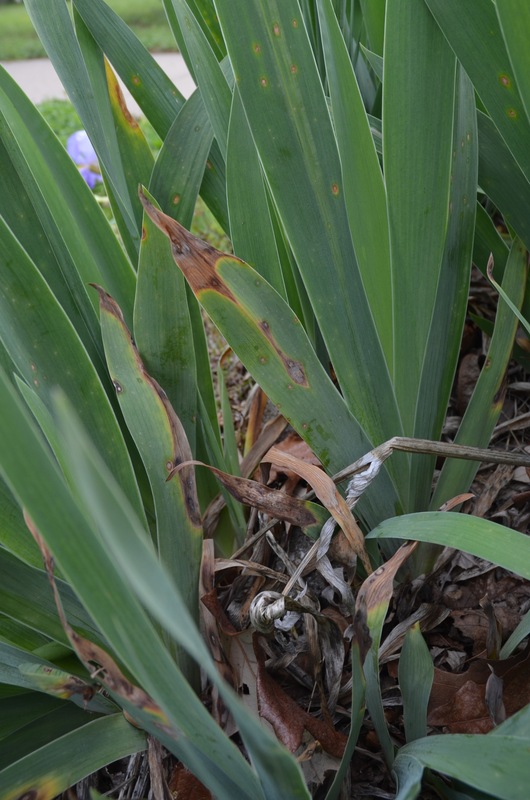 As the disease progresses, the tips of the infected leaves will appear scorched. 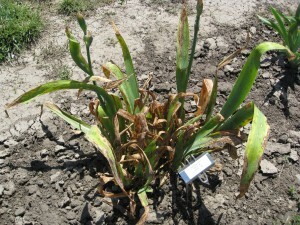 The disease will not kill the plant however it can reduce the plant vigor over time. How can you protect your irises? The first step is to practice good sanitation by removing all the dead leaves prior to spring green up. The fungus that causes iris leaf spot overwinters on the dead leaves from the previous year, and removing those leaves will break the life cycle. 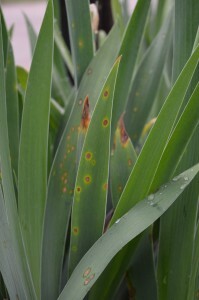 If you have a history of severe iris leaf spot and yearly sanitation alone is not effective, fungicides are available. 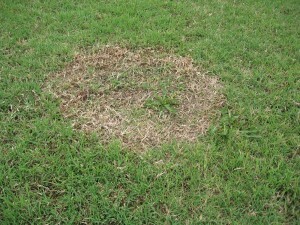 Fungicides can be sprayed every 10 days for 4 to 6 weeks starting when new leaves emerge in spring. 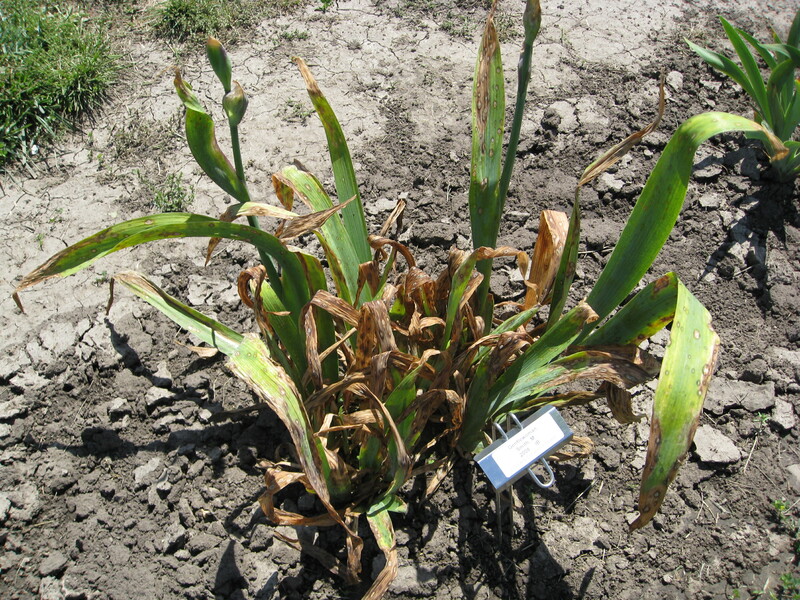 For more information on fungicide products and application for iris leaf spot go to http://www.hfrr.ksu.edu/doc1645.ashx. Be sure to follow the instructions on the fungicide label. 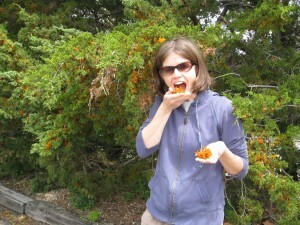 Rusts – three for the price of one. Will you win the prize? There are actually THREE different diseases visible in this ONE photo. Do you know what they are, and which is which? But, no matter how tasty they look (mmm, gummy bears???) don’t eat them. Bad Megan. Put that down! No! 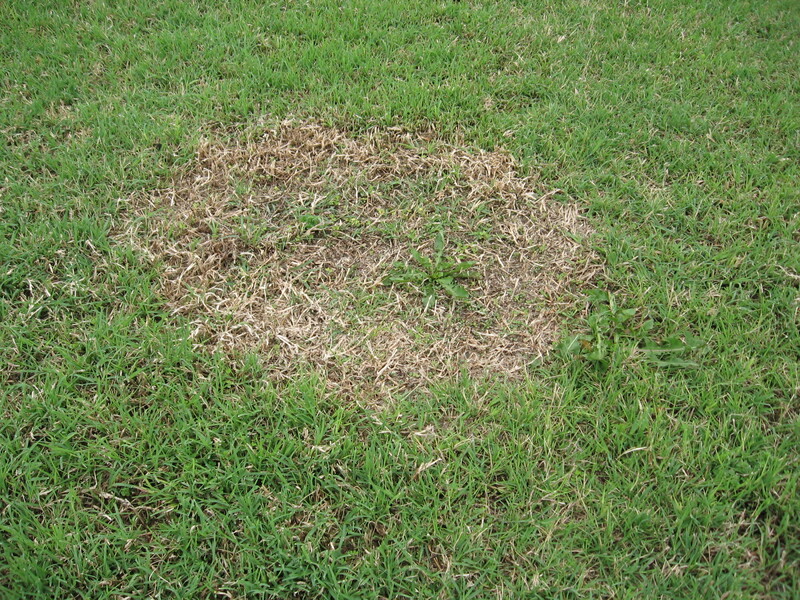 As our warm-season grasses green up, make sure to watch for spring diseases. 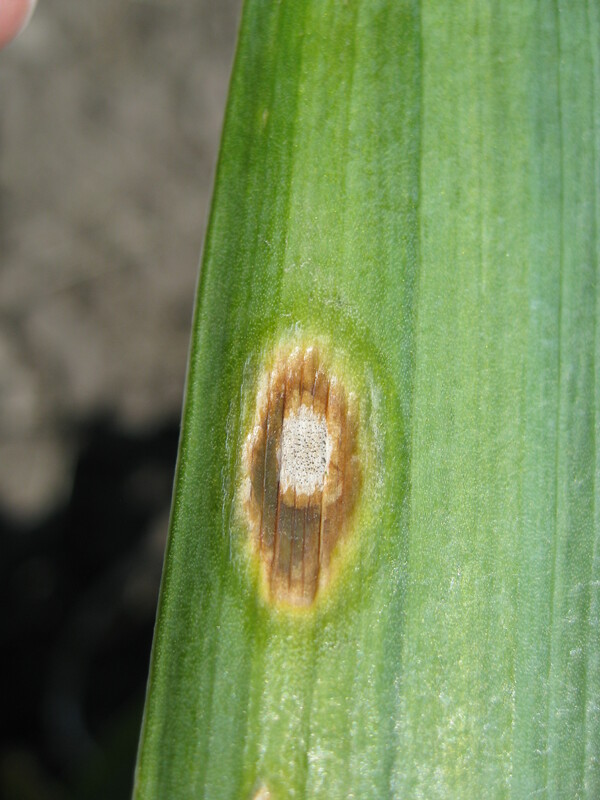 If you see these diseases, you may be eager to try something this spring, but the best time for fungicides is in the fall. 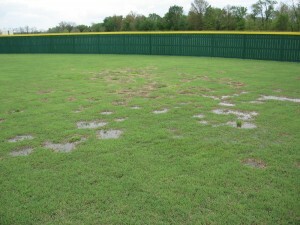 At KSU we’ve had good results for large patch with 1-2 fall applications. That is, fall applications have carried all the way through the following spring. 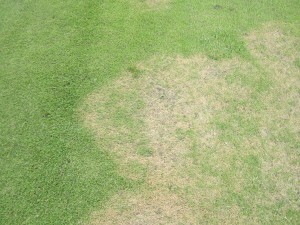 Spring applications can reduce the disease but are not as effective as fall applications. There is ongoing research in the turf research community to try to optimize application timing, though, including with our colleague Dr. Lee Miller at U of Missouri. 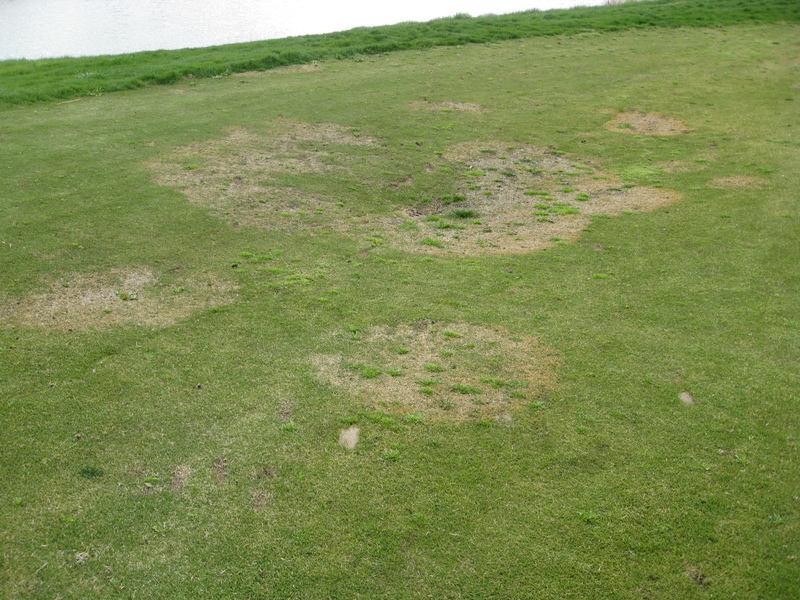 With spring dead spot, application success has been more spotty here, but again fall has proven more effective. However, sometimes fall applications just don’t work. Cultural practices are critical, and the link above shares some great tips. Just page through to the spring dead spot section. One very useful thing to do this spring is to take photos and map the diseased areas so that you can target those areas this fall. With large patch, I know several superintendents who only spray the known “hot spots” instead of entire fairways, with good success. What’s going on here? 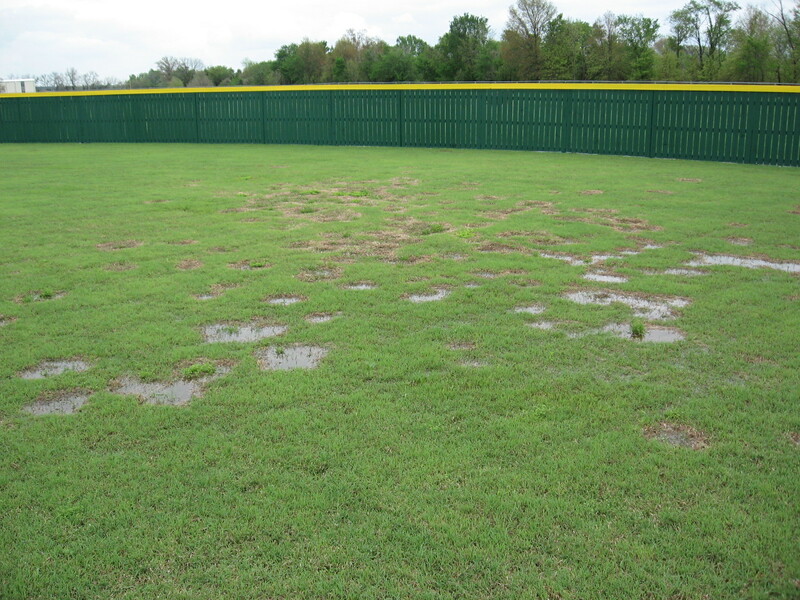 First – what grass is it? 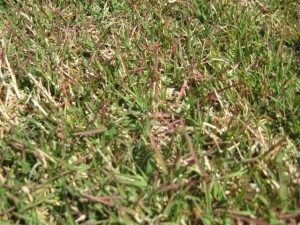 This is bermudagrass, one of our warm-season grasses. 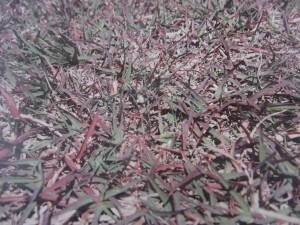 When we have cold snaps, these grasses can take on a purple-red tinge. 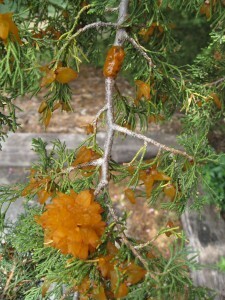 The chlorophyll is damaged and the anthocyanins become visible. 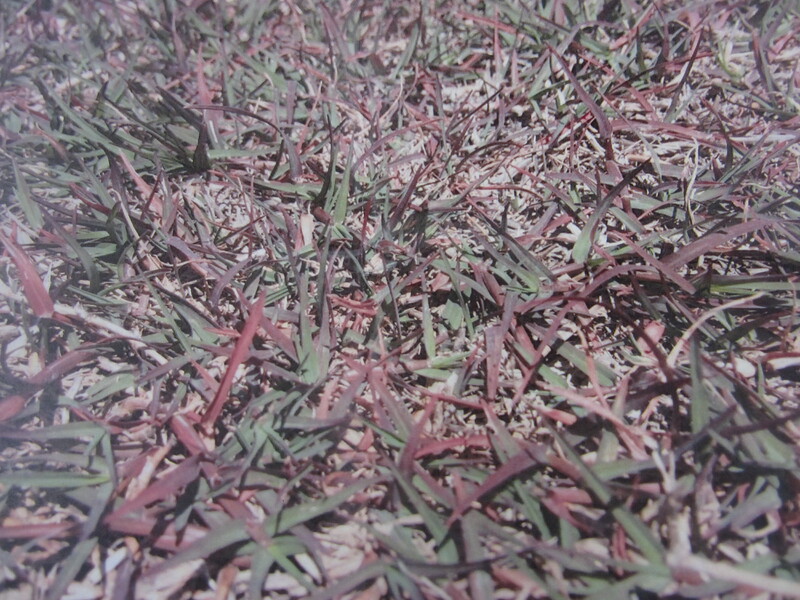 If you look across a whole field, the red-purple can also have a brown-ish appearance, and that makes people wonder about diseases. But, if you look closer, you’ll see that it is purple. 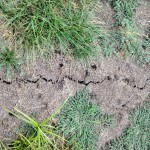 The turf grows out of it once temperatures are warmer. In many parts of the state our overnight lows dropped into the 30’s last week, so the timing fits the symptoms – that is another important piece. It’s not quite Wildcat purple. If we could do that, we’d have a nice patent on our hands and we wouldn’t have to worry about our research budgets anymore. 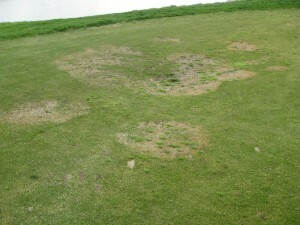 Here are some photos from a couple of years ago showing similar symptoms after a cold snap in early May. In the “long view” shot you can see how it can have a brownish cast, which can cause concern.